This one-of-a-kind hand-built motorcycle was way ahead of its time, then seemingly time traveled 50 years into the future. Every bike has a unique story behind it, from a highly modified custom job to the most common Harley-Davidson Street Glide. The story of the Traub is more than 100 years long, for half of which it was bricked up and forgotten about in a Chicago building. We wrote about this back in 2014. YouTuber Yammie Noob recently did a little more research on the Traub and discovered some more interesting pieces of the story—some of which contradict what we originally thought. Speed: "more than the roads will stand"
With that kind of mileage, clearly, Traub built the bike sometime before this letter was published in 1907, not in 1917 as we previously reported. In addition, a few components that Traub did not build, such as the carburetor, magneto, and wheels, date the bike to 1916. Perhaps this was the second version of bike detailed in Traub's 1907 letter. It's also possible that this is the original bike, and that Traub updated some of its parts between 1907 and the bike's disappearance. The Traub also had some amazing engineering in it, the likes of which are still not seen today. The engine was hand-built to such precise specifications that when the current owner rebuilt it, he only had to make one gasket for it. That's because there are no other gaskets in the entire engine. The design tolerances are that precise. Additionally, the bike used an unusual twin rear drum brake, actuated by a cam system. Brake shoes clamped not only the inside of the drum but also the outside, providing even more braking power. A modern disc brake is obviously more effective, but this would have been an amazingly powerful brake over 100 years ago. 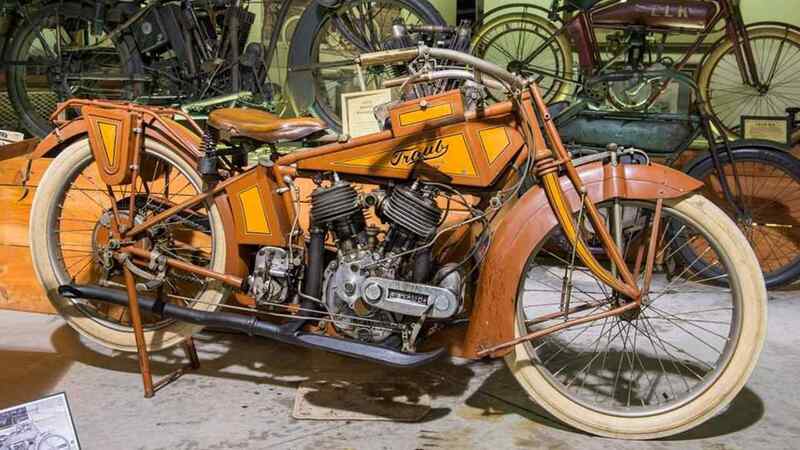 Back in 1967 a plumber was doing some renovation work to a building in Chicago and discovered a complete 1917 motorcycle with the unusual name of Traub on its tank. The building’s elderly owner admitted that his son had stolen the motorcycle before going off to the First World War, only to never return. Yammie Noob did some more research on this story. The 1910 Census lists a Gottlieb Richard Traub living on Paulina Street in Chicago, close to where the bike was found. He listed his occupation as a "toolmaker." A World War I draft card with the same name lists his occupation as an "experimental machinist." Could the Richard Traub who built this motorcycle be the same Richard Traub who served in World War I, not his son? Richard Traub died in 1952, which is a perfectly reasonable age for an elderly man who both built the bike and served in the war. Finally, there is absolutely no record of the alleged theft being reported. If you poured your heart and soul into building your own motorcycle from the ground up, wouldn't you want it found? If Traub was so upset about the stolen bike that he sent his son off to war as the story says, why wouldn't he report it to the police as well? Yet no police report exists of this bike's theft. There's still no explanation as to why the bike was bricked up in a Chicago building for 50 years, nor why it was so well preserved in what was effectively a time capsule. It remains on display at the Wheels Through Time museum in North Carolina. It still runs, too.